Getting organized in the New Year? Planning meals ahead of time is a great way to get a handle on menu planning in the new year. 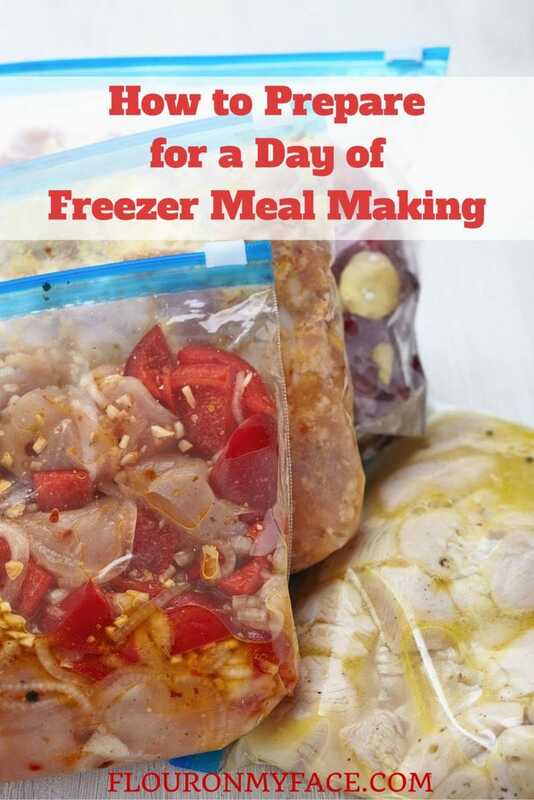 Check out How to Prepare for a Day of Freezer Meal Making so you can start stocking the freezer with freezer meals. Life gets pretty busy these days, and making a meal every night? Well, let’s just say take-out is a favorite on my phone. However, takeout every night isn’t exactly moneywise right now – the budget that controls our spending is breaking out the whip. An alternative meal plan is definitely in the future. One of the best ideas out there is the freezer meal. Made ahead using simple ingredients – what’s not to love about that? All right, this one may seem like a no-brainer, but how many times have you walked through the grocery store with a bag of chicken and nothing to pair it with? You get home, and you head back out for fast food, because nothing in your pantry makes sense. Picking out recipes ahead of time ensures two things: it’s usually healthy and it leaves almost no room for error in getting all of the ingredients. Win-win. Before you run out there and grab everything at the store, take a look at your in-home inventory. Take stock in what you have, don’t have and how it all fits into the recipes you just picked out. Write it all down, of course, so you aren’t duplicating efforts somewhere. Once you’ve seen what you have at home, fill in the holes by taking a trip to the grocery store. This is the perfect opportunity to stock up on some of the basics, while grabbing the things you need for your day of freezer meals. Also seems like a no-brainer, but I almost didn’t think about it at all. You’ve got to have space to put it all when you’re done, right? So clean out anything that has freezer burn, seriously dated or you just won’t eat. Should you feel extra enthusiastic, it’s a great time to do a heavy freezer cleaning prior to restocking. Disclosure: In an effort to make your foray into freezer meal cooking as easy as possible I have included links to products that I use and love. These links are affiliate links. I will earn a small commission if you make a purchase. So you’ve got all the supplies, but it may seem a little overwhelming, right? No problem – just make a party of it. Invite the girls over, split the cost and split the meals. The work will go a lot faster with some extra wine – um – hands to help out. Freezer meals may take a little time upfront, but in the long run, you won’t have to worry about a home-cooked meal while running your kids across town. Give it a try, and see what kind of great meals you can make. I agree, this is a great practice for the busy life. We just made a batch on Sunday. How many meals did you freeze? They sure can be Cheyanne.